Click here to find all the accessories for the Single Phase Fans including Louvre Shutters and Speed Controllers..
Vent Axia sceptre mounted axial fans. Plate mounted axial fans are based on an integrated impeller and internal rotor motor design which produces a very compact unit. Together with a specially designed bellmouth inlet and mounting plate, the complete fan is lightweight and ensures an excellent performance to sound level ratio. Motor insulation class F. Can be wired for reverse running. Manufacture controlled to BS EN ISO 9001. Performance tested to BS 848 Parts 1 & 2. Axial Motors The internal rotor motors are specifically designed and styled for this range of fan. Ball bearings are greased for life and allow the fans to be installed at any angle. Impellers are dynamically balanced to ISO 1940, motors are protected to IP65. Impellers The impellers are manufactured in die-cast aluminium and are fitted with narrow profiled blades, which provide the maximum efficiency at the maximum airflow. 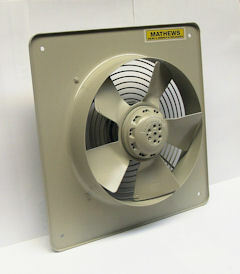 Form of running Plate mounted fans are supplied for extract use . When use for intake, the fan can be wired for reverse running, although the performance will be reduced by 30% (minimum). Terminal box Terminal boxes are to IP65 and are motor mounted. Protected against dust and water jets from any angle allowing outside applications. Guard Inlet wire guards are fitted as standard. External rotor motor, Die cast aluminium impellers, Fully speed controllable, Suitable for supply or extract. Plate Mounted Axial Fan. Thermal overload for motor protection.